Here’s an exciting start for 2012 for Ensembles followers! To start the year right, Ensembles hopes to meet more of their new fans as well as reward their long time loyal followers. A few more weeks and Summer is officially on! Summer means having fun, adventures and getaways. And Ensembles sure is getting an early start to summer! 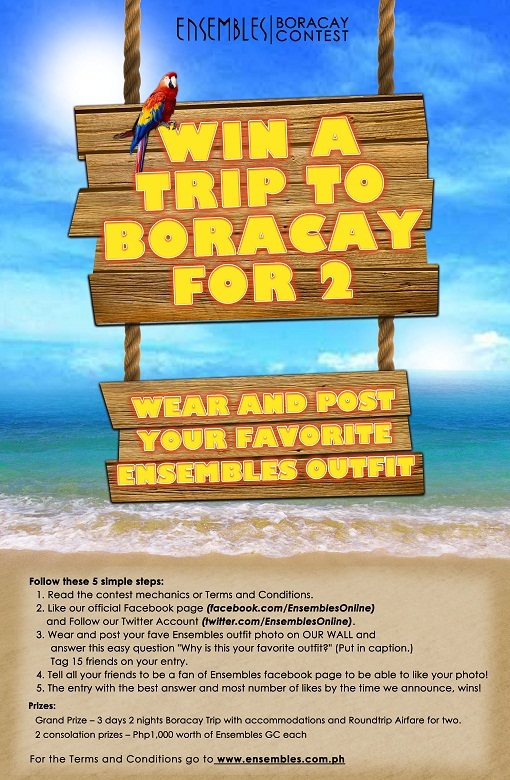 Ensembles is kicking this off by giving away an All Expense Paid BORACAY TRIP for TWO! Now that’s a chill way to plan out your summer getaway, sans the breakdown service you’re gonna have to consider when you go on a road trip. Join Ensembles Facebook Photo Contest this January 16 and reach for 20,000 Facebook likes. Once Ensembles reach this number, a lucky fan will be basking with her companion under the sun! Just upload a photo of you wearing your fave Ensembles outfit, tell us why you chose this photo and ask your friends to like it. The entry with the best answer and most number of likes wins! To join the contest, visit our facebook page: www.facebook.com/EnsemblesOnline and www.ensembles.com.ph for the full mechanics.